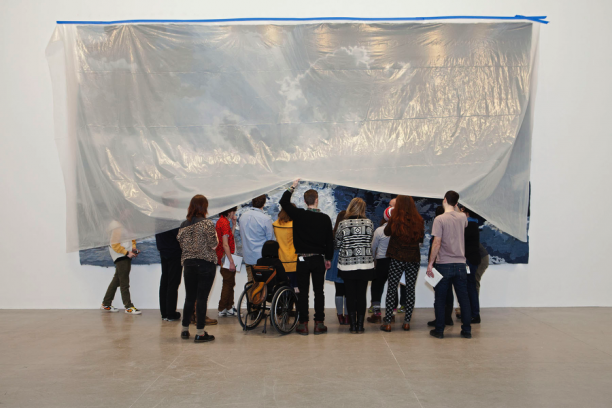 Leading Contemporary Art Museums Release "Room To Rise"
To download the full Room to Rise report, visit whitney.org. LOS ANGELES—A national consortium of leading contemporary art museums today released results from a groundbreaking research and evaluation initiative exploring the long-term impacts of museum programs for teens. Drawing on reflections and input from hundreds of program alumni across the United States, this study documents powerful effects for participants, including lasting engagement with arts and culture, significant personal and professional development, and increased leadership skills and civic engagement. The Whitney Museum of American Art, the Walker Art Center, the Contemporary Arts Museum Houston, and The Museum of Contemporary Art, Los Angeles conducted the multi-year study with support from a National Leadership Grant from the federal Institute of Museum and Library Services. Each of the participating museums is home to a nationally recognized teen program that has operated continuously since the 1990s. These programs bring highly diverse urban youth together to work collaboratively with museum staff and artists, developing vibrant activities and events to engage teen audiences, from tours and exhibitions to performances and fashion shows. The study offers a detailed look at the lasting impact of these programs on participants and highlights key engagement strategies for educators. When young people are immersed in a learning environment that blends contemporary art, meaningful collaborative work with peers, and supportive interaction with artists and museum staff, they are inspired to see the world differently. John Ildefonso—now an artist and art educator—said the MOCA program “exploded my notions of what was possible.” Even years later, ninety-five percent of survey respondents considered their experience to be either “a very good experience” or “one of the most important experiences I’ve had.” These programs lift the veil on museums, introducing young people to a world of art and new ideas while empowering and challenging them at a critical developmental moment. Program participants reported that their experiences as teens in museums were transformational, shaping their adult lives in significant ways. Teens experienced a dramatic change in their appreciation for museums’ role in society and their sense of belonging in museums. Many are active museum visitors as adults—over 95% of alumni had visited an art museum in the past 2 years, and 68% had visited 5 times or more during that period. In addition, these programs open teens’ eyes to new career paths and opportunities, help them crystallize professional goals, and promote long-term academic and career development. As one Walker alum explained, “I knew I loved art and museums, but I didn’t know about the museum as a possible career path until I joined WACTAC [the Walker Art Center Teen Arts Council]. WACTAC exposed me to an array of museum jobs that seemed exciting, worthwhile, and attainable from my position on the inside.”Across all institutions, 70 to 75 percent of alumni surveyed indicated that the program had either a great or strong impact on their level of knowledge, participation, and interest in art. These teen programs intentionally bring together an extremely diverse cohort of young people, and this mix of cultures has important implications, according to alumni. Many reported finding unexpected personal connections with people from different backgrounds. A shared interest in art and the experience of working collaboratively helped young people overcome perceived differences and learn how to communicate with others unlike themselves. A former participant at MOCA explained: “My experience of interacting and working with others from diverse backgrounds challenged and fortified my understanding of the world in which I lived... it encouraged me to become an active participant in my surroundings.” When asked to identify the best part of the program, alumni from all four institutions named their diverse peer group and the opportunity to do authentic, hands-on work most frequently. Empowered by their experiences, these young people go on to become leaders in their communities, seeking ways to give back and to connect others to cultural opportunities. “Teen Council inspired me to create more diverse and fertile art education programs for teens everywhere,” said CAMH alum Chanelle Frazier. Many go on to work in youth development, education, community organizing, and the arts, making contributions to their communities that further amplify the positive effects of these programs. About the Study: The four programs considered in this study were launched between 1992 and 1999. The study is based on the programs from their inception (1992-1999) through spring 2011. When data collection began, in 2011, participants and alumni ranged in age from 18 to 36; approximately 600 students had participated over the combined lives of the programs. More than 300 former program participants contributed to the study. Data collected included a 34-question online alumni survey (315 responses), 2 alumni focus groups, 24 arts-based case studies, 12 alumni interviews, 12 senior staff interviews, archival institutional research, and a literature review. The study took a rigorous practitioner-researcher approach that involved museum staff as essential, active participants while Lead Research Advisor Mary Ellen Munley served in an advisory and training capacity. Release of Findings: A full color book, Room To Rise: The Lasting Impact of Intensive Teen Programs in Art Museums is available in print or as a free digital download at whitney.org, along with video content, technical supplements, examples of instruments, and other resources. The Whitney Museum of American Art will host a presentation of findings and a panel discussion on April 20. Findings will also be shared at national conferences, including the American Educational Research Association conference in Washington D.C. in April 2016. Join us to learn more about the report and findings from this study. Practitioners and researchers from MOCA will discuss the long-term impacts of teen programs on the participants, the museum, and the greater community. The Whitney Museum of American Art, founded in 1930 by the artist and philanthropist Gertrude Vanderbilt Whitney (1875–1942), houses the foremost collection of American art from the twentieth and twenty-first centuries. The core of the Whitney’s mission is to collect, preserve, interpret, and exhibit American art of our time and serve a wide variety of audiences in celebration of the complexity and diversity of art and culture in the United States. Through this mission and a steadfast commitment to artists themselves, the Whitney has long been a powerful force in support of modern and contemporary art and continues to help define what is innovative and influential in American art today. For more information, visit whitney.org. One of the most internationally celebrated art museums and multidisciplinary art centers, the Walker Art Center in Minneapolis is known for presenting today’s most compelling artists from around the world, as well as modern masters. In addition to traveling exhibitions and its world-renowned collection, the Walker presents a broad array of contemporary music, dance, design, and theater, and the best in film and moving image arts. For more information, visit walkerart.org. The Contemporary Arts Museum Houston is a non-collecting institution dedicated to presenting the best and most exciting international, national, and regional art. Through dynamic exhibitions accompanied by scholarly publications and accessible educational programs, the Museum reaches out to local, regional, national, and international audiences of various ages. CAMH is a nonprofit organization that relies on a variety of funding sources, including individual, government, and corporate, for its activities. For more information, visit camh.org. Founded in 1979, MOCA’s vision is to be the defining museum of contemporary art. In a relatively short period of time, MOCA has achieved astonishing growth with three Los Angeles locations of architectural renown; a world-class permanent collection of more than 6,800 objects, international in scope and among the finest in the world; hallmark education programs that are widely emulated; award-winning publications that present original scholarship; groundbreaking monographic, touring, and thematic exhibitions of international repute that survey the art of our time; and cutting-edge engagement with modes of new media production. MOCA is a not-for-profit institution that relies on a variety of funding sources for its activities. For more information, visit moca.org.